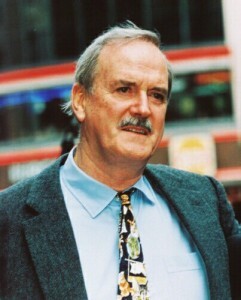 Cleese is talking about his work and his life - then taking questions from the audience, and I'm so looking forward to it. He's speaking at Seattle's Moore Theater, a venue small enough to allow some faux-real intimacy between him and us audience members. I have a great seat close up; I plan to take notes since he's talking about his work. I believe he's a genius in the realm of the psychology of comedy. You'd think as much as he knows about psychology (he's even written books on the subject) Cleese would have successful marriages, but ... no. Word has it he's going to talk about his marriages - in fact his litany of appearances are titled, "A Final Wave at the World or The Alimony Tour, Year One." Apparently he's paying alimony with the money he makes from these speaking engagements. Which means his performance should be hysterical - after all, pain+time=humor. Speaking of pain, like so many men over 50, he's also discussing his current and recurring medical problems, and, like all beauty contestants - is addressing the issue of world peace.